Every now & then, our home projects need a little upkeep & a breath of fresh air. Whether you have just installed a new butcher block countertop, created your very own cutting board, want to seal in a beautiful new piece of terra cotta clay pot art, or simply want to give your wood furniture or a side of the road/thrift/antique shop a personal touch, The Real Milk Paint Co. has their own Tung Oil & Citrus Solvent Half & Half combination that is perfect for breathing new life into wood. Not to mention it smells like fresh oranges; heavenly! 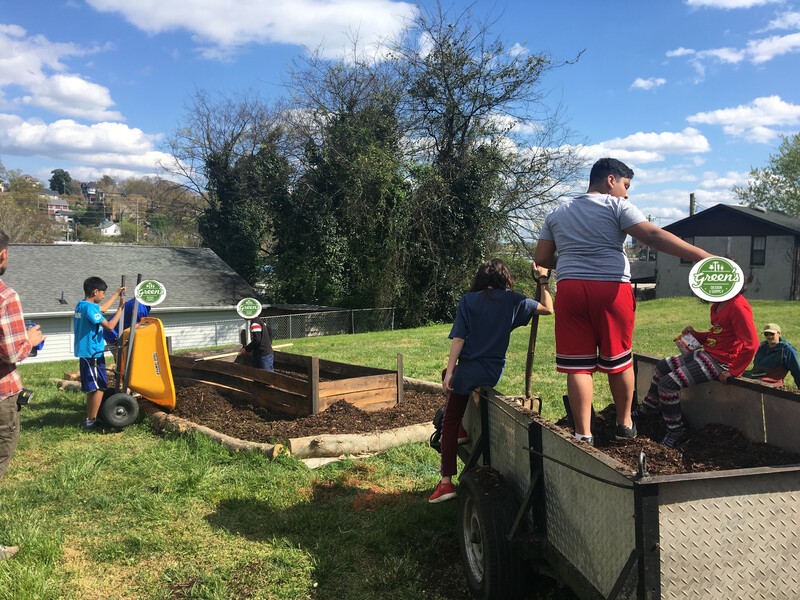 At Green's we had two projects that tend to come up in the spring: bathroom remodel & refinishing our shovels for our community garden project. For both of these projects, we wanted to refurbish a wooden piece by sanding & finishing. 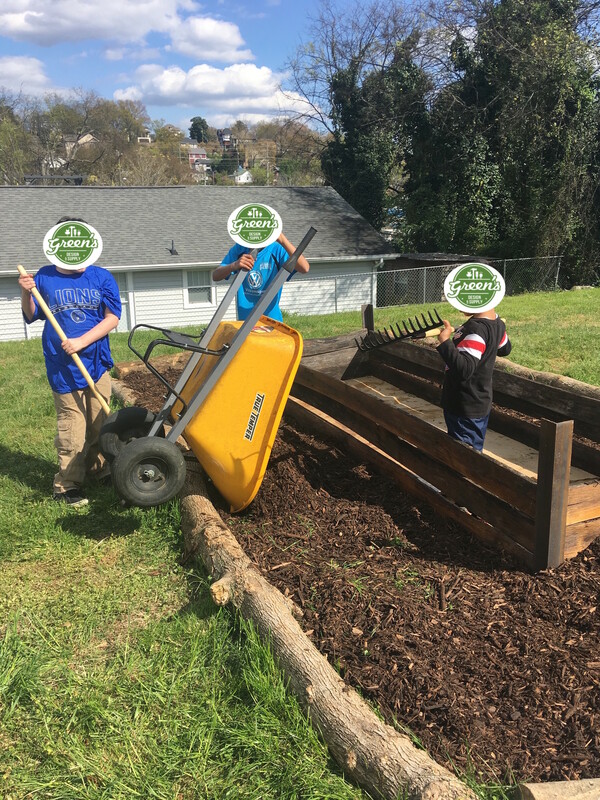 In the case of the shovel, kids will be using the it for a Chattanooga community garden & we wanted to make sure no one would get splinters or blisters making it all around safe, but we didn’t need to buy a new shovel. In this case, we used the Real Milk Paint Pure Tung Oil mixed with Citrus Solvent, known simply as Half-and-Half. 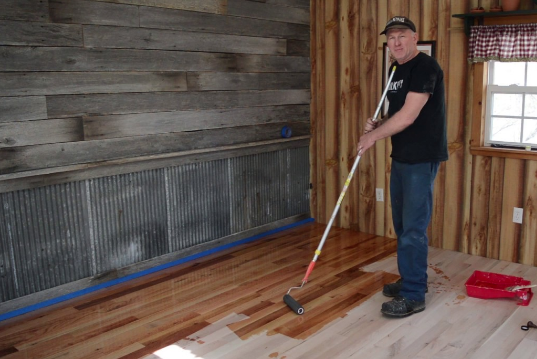 For many projects, Pure Tung Oil, a great all natural finish, can be the perfect product. Pure Tung Oil comes from a nut like a walnut, however, because it is a drying oil, we have not found that it causes allergic reactions such as non-drying nut oils, like peanut oil. Tung oil is harvested from the seeds of the tung nut tree. 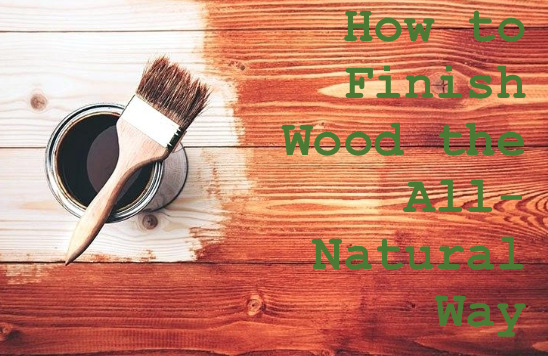 It’s a favorite among woodworkers and other crafters, construction experts and DIY fans because it has the ability to harden into a protective coating that wards off moisture. 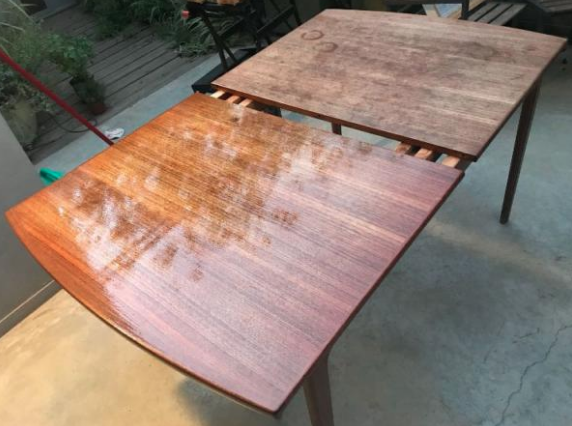 Once tung oil is exposed to oxygen, it begins a chemical process called polymerization, eventually morphing from a viscous substance into a hardy yet flexible & fully transparent layer that stands guard between wood & other elements. For our shovel & shelf project, this was a bit too thick to penetrate. Thinning with a natural solvent like Citrus Solvent helps the oil penetrate deeper into the material. The 1 to 1 or Half & Half ratio works great all around for most surfaces like new raw wood, butcher block countertops, cutting boards, concrete, terra cotta clay pots, stone, and slate. This finish is also food contact safe! Generally, 3 to 5 coats are needed to seal and waterproof the surface you are working with; on our shelving we used 4 coats, & on the shovel handle we used 5 as it was a bit more worn. If you want to see what the color of your surface will look like prior to oiling, all you have to is wet the surface with water. The surface’s appearance when it is wet is the color you have when the oil is dry. 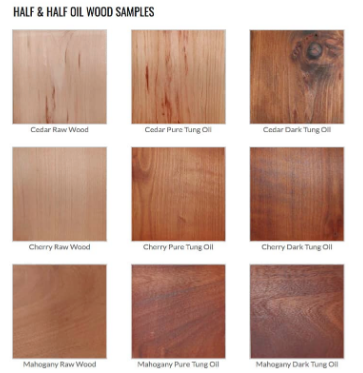 It can also be mixed with any other of our Tung Oil Products (i.e. Pure Tung Oil, Dark Tung Oil, Dark Half). Keep in mind that depending on how porous the surface is, you could need up to 5 coats. To cover a 400-square-foot area, for instance, you would need a little over 5 gallons of Half & Half. Do not sand wood grain too fine. 150 grit sandpaper is fine enough. Do all your sink cut outs, back splash, drilling & sanding before starting the finishing process. Apply the Half & Half with a brush over the whole surface. Reapply coat after coat feeding the wood cells until it will not accept anymore. Wait 40 minutes to an hour & look for dry spots, then feed the dry spots until uniformly glossy. Note: This may take several hours. 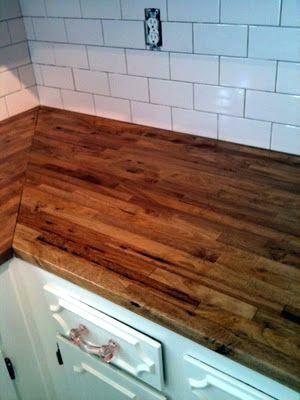 If finishing counter, you can do one or two coats of Half & Half. 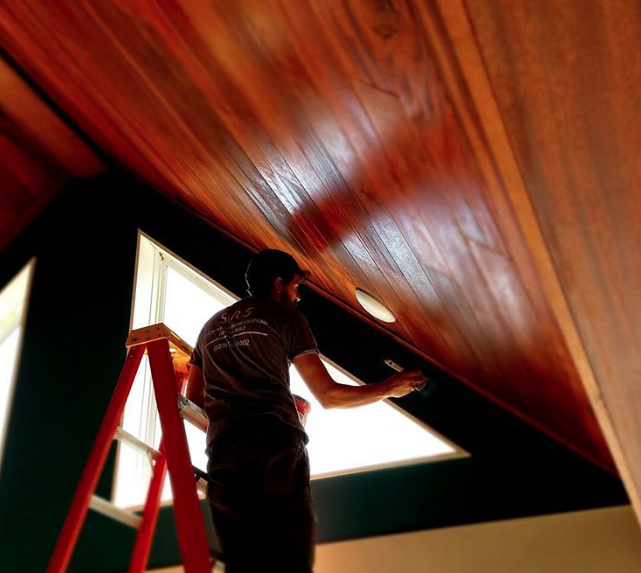 Coating the underside helps to even out the absorption of moisture into the wood & slows down expansion & contraction. 2) Feed the wood again until it puddles. Let the 50/50 mixture sit on the surface to penetrate; when it seems no more will absorb wipe off the excess. 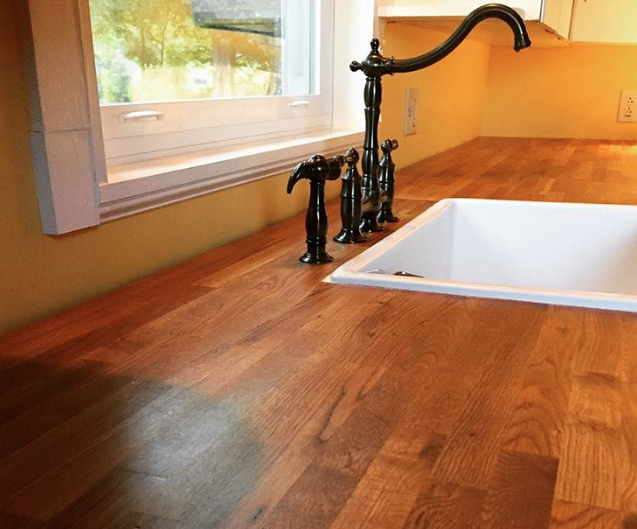 Watch the wood countertop for seeping over the next 5-7 days. Wipe off any seepage with clean rags & lightly buff the surface for the next week or so. Note: The Pure Tung Oil takes 15-30 days to fully cure. During this time you can still use the top, we just suggest not to leave absorbent materials like paper or placemats on the countertop & keep dishes and bowls from sitting overnight. However, you can still use and entertain while the oil dries. To maintain the counter top, make a solution of 2 parts Citrus Solvent to 1 part Pure Tung Oil (or simply use the Half & Half mixture, but we suggest have the Citrus SOlvent around as it has many purposes & works great when diluted as an all-natural, concentrated cleaner. We like to mix with water & use it in glass cleaner for kitchen, bathroom, & countertops.). Apply your mixture very thinly with a rag. Do this maintenance coat when you feel the wood is dry and absorbing water from cleaning. Maintenance coats should be allowed to dry a day or two, then you can go back to full use again. 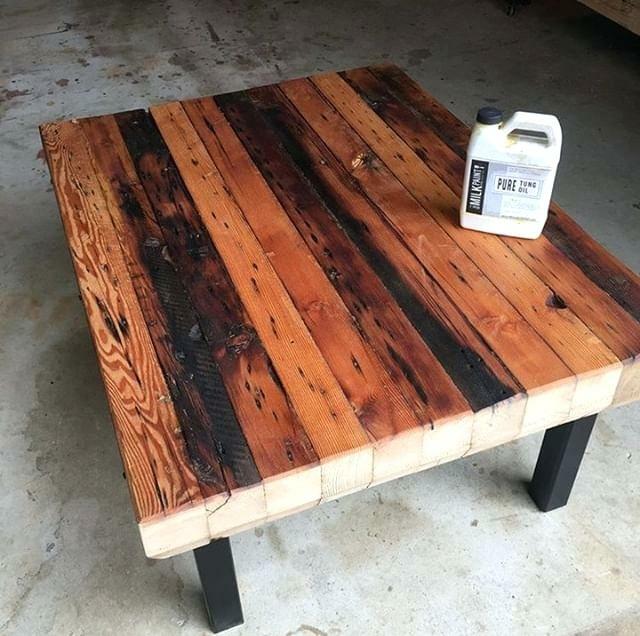 *Note: All of the instructions here also apply to the Dark Raw Tung Oil. Put used rags outside & hang up to dry before disposing in the trash. Have fun on your spring projects, & give us a call if you have questions about your own project or any of the products we have in our store & follow us on social media for pictures of customer & Green’s projects.